I got today's blog idea from Debbie Carr, an ALA certified Lighting Specialist in my showroom who does all the lighting design for both of these companies: JP Brehony Homes and Encompass Design Build. They sent her this news brief, and we thought we should share it! On Saturday, October 17th, and Sunday, October 18th, from 10:00 - 4:00, Troy Fenley of Encompass and JP Brehony will be present to assist you in any remodel/renovation ideas at the "Remodeled Home Tour", at 2634 N. Vermont St., Arlington, VA 22207. Come out and see what your home can grow in to! On Saturday, October 24th and Sunday, October 25th, from 11:00 - 5:00, JP and Troy will both be available at the Annual Custom Builders Parade of Homes at 7103 Eastman Drive, Falls Church, VA 22043. Our entry this year is a Fully Decorated, Stone and Stucco, European-Style home with the latest in Green and Energy Saving Technology. Join us for a Cheese and Fruit Pairing from 12:00- 4:00. 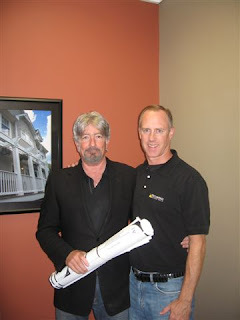 Vienna, VA – October 6, 2009 - JP Brehony, owner of JP Brehony Homes, and Troy Fenley, owner of Encompass Design Build, have launched a new venture addressing a question that many homeowners in our area face: Move or Improve? Sharing leads for the past four years, Brehony’s custom home business and Fenley’s full-service remodeling firm have discovered a need for unbiased information comparing new home construction against major remodeling. By blending their individual experiences and vast professional resources - a combined 35 years of experience in residential construction and remodeling in Northern Virginia - they are focusing on something no other firm in our community is offering. The financial equation behind choosing a new home vs. a significant remodel is confusing and complex, and Brehony and Fenley have found clients to be receptive to their consulting. Traditionally these interests are served in two distinct types of companies. One, unbiased resource is proving to be effective and efficient. The question still remains for many homeowners: Move or Improve? Brehony and Fenley answers this question by comparing both sides of the equation and presenting hard facts and figures to arrive at the optimum decision. After a decision is made to Move or Improve, JP and Encompass orchestrate the entire process – from design through construction. Each firm remains independent and continues to focus on its’ specific areas of expertise. The primary benefits of the combined relationship are: the research and decision-making process is easier and clearer; and clients now have the opportunity to add the signature Brehony look to their remodeled home. The Singh family in Vienna has realized these benefits first hand. After considering a custom Brehony home, they found an existing property that met most of their requirements. However, they needed a second-story addition to complete their wish list. The Singhs, who are currently in the design phase, will have the first home with the JP Brehony look applied to an Encompass remodeled home. "It was very helpful to our decision process to have the opportunity to work with JP Brehony and Encompass Design Build as a team. We wanted the JP Brehony look and feel, but not a whole house product. Working together, we can have the best of both worlds," the Singh Family said. Encompass Design Build is a full-service design-build firm specializing in kitchens, bathrooms, additions and total home renewals. Encompass clients benefit from the firm’s award-winning design team and its commitment to a proven project-management process. Encompass, based in Vienna, VA, has been serving homeowners in Northern Virginia for 8 years. Visit the Encompass Design Build web site: www.encompassdb.com. JP Brehony Homes is dedicated to families, our community and our Town. Their homes are constructed as authentic Southern Farmhouse, Arts and Crafts Bungalows, Coastal Cottages and graceful Victorians. These unique structures reflect classic in-town, turn-of-the-century to mid-1900s architecture, and are designed to enhance exterior streetscapes while benefiting the lifestyles of families seeking a stronger sense of old-fashioned community. Visit the JP Brehony Homes web site: www.jpbrehonyhomes.com.